Sa Do-Chan and Oh Ha-Ra, with their search warrant in hand, examine the crates inside Geum’s truck. Instead of finding the money, the crates contain nothing but cabbages. Geum Tae-Woong claims he picked them up when he was in Gangwon. Oh Ha-Ra and Sa Do-Chan are left bewildered...and angry. They know Geum has done a job on them! Arriving in his office with Jo Sung-Doo, Geum lets out an evil laugh, obviously pleased with himself for having hoodwinked the prosecutors. He tells Sung-Doo to never be bullied by people. To be the deceiver but not the deceived. Moon-Sik arrives carrying a box for Geum from Director Song of the casino. Geum sends Moon-Sik and Sung-Doo out of the office so he can review the contents in privacy. Sitting at the coffee table, Geum places the box on the table, eagerly excited to open the box as soon as the others leave the room. Lifting off the lid, Geum discovers a diary, and inside the dairy are the bearer bonds Geum has been waiting for, totaling two hundred million won. He talks to himself, saying how hard he had worked for Choi Jung-Pil to get this money, and covers his face with the bonds, relieved to have them in his hands at last. Meanwhile in the interrogation room, Oh Ha-Ra and Sa Do-Chan discuss the results of their search. They speak about how Geum had them fooled into thinking he was transporting cash when all they found was cabbage. Not all a complete loss, Do-Chan reveals that at least they know that Geum has unregistered bonds and not cash. However, they cannot get a search warrant for bonds; they have to make Geum bring the bonds to them in the open. Ha-Ra asks Do-Chan how they are going to do that? Do-Chan replies that prosecutor and con-man must work together to get this done. After securing his bonds in a safe location, Geum calls Chief Prosecutor Jin Kyung-Hee, complaining that her prosecutors have been bothering him again and demands she reign them in. He reminds Jin of the one million dollars he paid her, informing her that if anything were to happen to him, they will be able to trace the money to her and, thereby, alerting the investigators to her participation in the department's corruption. Immediately following the call, Chief Yang storms into Jin Kyung-Hee’s office, flinging open the door and confronts her, to tell her he has respected her as his senior but no more and demanding to know if she has accepted a bribe or if Geum has something on her. Surprised at Yang’s approach, Jin stands up and removes her glasses. Yang wants them to speak openly as they went to college together, but Jin responds by saying she will prove that ‘he’ is not Baek Joon-Soo. Prosecutor Yang is undeterred and vows to take Geum Tae-Woong down. Sa Do-Chan and his own team discuss how they can get Geum to flush out the two hundred million dollars in bonds. Do-Chan tells Eun-Ji to report Feel Gallery to the FSS. In-Tae is given the task to send a rumor to the media that Special Investigations are investigating K Savings Bank which will cause the members of the Namsan Club to become nervous. Meanwhile, Director Bong will drop hints that FSS is monitoring the bond market. Do-Chan believes that if Geum begins to get nervous about these investigations, he won’t be able to transfer his bonds within the country. He will have to resort to way to transfer them elsewhere. The Switch team goes to work. Geum Tae-Woong is visited by two officers from the Insurance Fraud department of the FSS. They have come due to information received from the Insurance Fraud Recognition System, informing IFSS that Feel Gallery received more insurance money for the Central South-American Exhibit that claimed artwork had been damaged than the Gallery was entitled to. Geum agrees to pay the fine, and Feel Gallery is indefinitely closed pending further investigation. In-Tae publishes online the rumor that the prosecution office is investigating K Savings Bank. The members of the Namsan Club gather, without Geum, to discuss the investigation and what they should do. They all decide that for the integrity of the Bank and to save themselves, they want to oust Geum Tae-Woong as director and CEO of the Bank. Calling Geum, one of the members informs him that they all agreed that he should stand down from his position. Geum, not pleased at all, threatens to pay them back later for this insult. Manager Kim lies sleeping in his cell with three other inmates. As soon as they are sure Kim is asleep, his cellmates suddenly get up out of bed and begin to beat him up, badly. Investigate Go receives a telephone call in the office, informing him that Kim has been beaten into a coma. A horrified Go informs the team of Kim's condition. 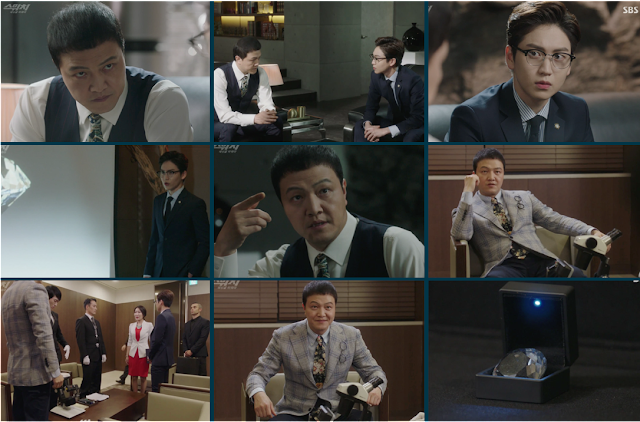 Simultaneously, Jo Sung-Doo runs into Geum’s office, reporting the incident to Geum. Instead of showing concern, Geum informs Sung-Doo that he made sure Manager Kim would not be able to talk. Sung-Doo opens his eyes wide in shock upon hearing this. Knowing that he does not have time on his side, Geum meets with international lawyer Park and tells Park he needs to tie up the matter of the bonds urgently. Lawyer Park suggests the idea of transferring the bonds overseas to which Geum nods his head in agreement. Presenting Geum with an idea of purchasing a huge, sixty karat diamond known as the White Star. However, Park informs Geum that this diamond has been missing, but Geum wants Park to find its location. Having succeeded with finding out the location of the diamond, Ms Grace Chung, from the Chentai Group, and her team arrive in Korea and meet with Geum Tae-Woong. Once the formalities are over, Geum is eager to get on the appraising the White Star diamond. While Geum puts on his white gloves, one of the Chentai members produces and opens a briefcase to expose a jewellery box. Opening the box to reveal a huge sixty karat diamond. Before Geum met with the Chentai Group, Sa Do-Chan and his team designed a scheme. Director Bong will design a special briefcase to carry the diamond. The briefcase is designed to have two openings: the genuine diamond will be in one side, flip the briefcase over and when opened a fake replica will be in the other side. For appraisal purpose, the genuine diamond will be presented. Upon sealing the deal, the fake will be handed to Geum Tae-Woong. Before meeting Geum, Bong instructs those from the Chentai Group to practice with the briefcase. After a jeweler has finished looking at the diamond under a microscope, he informs Geum that the diamond is flawless to which Geum smiles in relief and agrees to pay one hundred and sixty million dollars for it. Ms Grace Chung, however, interjects and raises the price to two hundred million dollars, blaming the increase due to the daily change in its worth. Not happy with this sudden hike in price Geum suggests one hundred and eighty million dollars. Not prepared to accept this amount, Ms Chung stands up to leave while her bodyguard picks up the briefcase. Realizing this may be his only chance, Geum buckles and agrees to the two hundred million dollar price tag. Everything is going to plan, until the bodyguard puts the briefcase down on the table. They all recognize he had forgotten to turn the briefcase upside down! The replica diamond was meant to be facing up, but instead the real diamond is. How on earth can they fix this without arousing Geum’s suspicion? The bodyguard begins to sweat and fidget which attracts Geum’s attention. In-Tae, suggesting that the bodyguard may wish to use his handkerchief, deliberately kicks the briefcase off the table as he turns to face the bodyguard. The briefcase falls to the ground, allowing the bodyguard to correct his initial mistake. All is saved! Geum hands over the two hundred million dollars in bonds, and the fake replica is handed over to Geum Tae-Woong. They all breathe a sigh of relief. Back at the apartment the team admire the real White Star. In-Tae admits to almost fainting with the bungle, and he is praised in turn by Director Bong and Do-Chan for his quick thinking. Eun-Ji is transfixed by the diamond’s beauty. Bong attempts to retrieve the diamond from her hands but ends up having to resort to gently slapping her hands in order to break the diamond's spell. Finally placing the diamond safely back in the briefcase, Sa Do-Chan tells Director Bong he wants to take care of it and return the White Star to its rightful owner. As a result of Do-Chan's order, Director Bong, dressed as a ragged vagabond, walks into the police station and approaches an officer who is sitting at his desk. Bong tells the office that while he was wandering around he came across this diamond known as the White Star. At the apartment, the team celebrate the successful switch and Geum's now public loss with cans of beer. Eun-Ji and In-Tae jump on the couches, beer spilling everywhere while Bong raises his can for a toast. At the prosecutors office, Ha-Ra and Do-Chan clash knuckles together in a ‘high five’ gesture. The team discuss who the owner may be and whether or not they will want to claim it belongs to them, considering it was paid for with dirty money. If it is not claimed, the White Star will be sent to the national treasury. Suddenly they are interrupted by the arrival of Officer Kang and three of Geum’s former thugs. Kang managed to locate them and brought them to Ha-Ra as they were a part of the Incheon Port Storage gang bust-up with Sa Ma-Chun. They denied having killed anyone, but they did confess to being involved in the incident. They also confirmed that it was Geum TaeWoong who had killed Sa Ma-Chun. Sa Do-Chan is visibly upset. Ha-Ra asks the others to get a warrant ready. Geum Tae-Woong, in the meantime, rushed to international lawyer Park’s office, only to find the real lawyer Park Hyuk sitting at the desk. Not the one he had met and to whom he had entrusted his matters. Returning back at his office, he throws the doors open and leans over the back of the couch, howling in anger just as Prosecutor Oh Ha-Ra walks into his office. Looking at Ha-Ra with hatred, his face soon turns to defeat when Officer Lim produces and shows Geum the arrest warrant. Ha-Ra reads Geum his rights of arrest for the murder of Sa Ma-Chun. Now under arrest, Geum sits opposite Ha-Ra in the interrogation room. Ha-Ra addresses and questions him about Sa MaChun’s murder. Sa Do-Chan, then, enters the room and sits down while Geum comments that he is deeply displeased at Sa Do-Chan for scamming him on the diamond sale. Suddenly Jin Kyung-Hee enters the room followed by Gil Dae-Ro and officers from Internal Affairs, accusing Do-Chan of being the fake and demanding proof of his identity. Prosecutor Yang then enters the room and berates Jin for accusing Do-Chan without any evidence or proof. Gil Dae-Ro presents a yellow folder containing an old file that Joon-Soo had worked on. During that investigation Joon-Soo had been injured and to exclude him from other blood samples, his DNA had been recorded. Prosecutor Jin demands that Do-Chan report to Internal Affairs and provide them with a blood sample. If the sample matches she will acknowledge him, if not the game is up and the case against Geum is annulled. Ha-Ra, looking worried, remains silent while Yang, who can not believe the audacity of Jin, is drowned out by Geum with his obstinate, gloating comments. Sa Do-Chan stands and agrees to give him the blood sample. Seated in the phlebotomy lab, Do-Chan sits quietly while his blood sample is taken. He is then instructed to attend the internal affairs interview room and sits opposite Jin Kyung-Hee, while the officers from internal affairs stand behind her. Chief Yang is furious and yells at Jin, asking her is she really must do this. Ha-Ra is surprised to see him this angry and nervous about the results. At this point, Gil Dae-Ro enters the room with a file containing the blood test results and places them in front of Jin. She looks through the results and is visibly shocked. As she remains speechless, Gil bows and apologizes, confirming that the blood samples are a 99.99% match and that this man is indeed Baek Joon-Soo. Bingo! While Ha-Ra is initially at a loss at the the results, Joon-Soo flashes back to the phone conversation he had had with Sa Do-Chan. Still recovering from surgery, Joon-Soo warned Do-Chan that he suspects Internal Affairs are onto something. Joon-Soo is adamant that he will come in despite Do-Chan’s concern for his health. Before he joined Ha-Ra in the interrogation room with Geum, Do-Chan went downstairs and outside to an awaiting van where he switched with Joon-Soo. Before leaving, Do-Chan handed Joon-Soo his ID badge. Leaving the internal affairs section, Ha-Ra and Joon-Soo enter the lift. On the way Ha-Ra says ‘I’m glad to see you so well, Baek Sunbae!’ He looks down and softly smiles. Waiting for the prosecutors to return, Geum tells his lawyer that he is going to turn the tables on them and they will walk out of there. Oh Ha-Ra walks in with a solemn look on her face and sits down. Geum laughs, mistaking Ha-Ra’s expression for defeat and asks her where Do-Chan is. Leaning over the table, he then points his finger at her, warning her that her career is over. Confident that Do-Chan has been caught, Geum begins to leave. Just then, Baek Joon-Soo suddenly walks into the room. Geum wants to know why this con man is allowed back in the room, and Ha-Ra presents the blood test results to Geum. Geum reads that the two blood samples are a 99.99% match and collapses back into his chair, nearly losing his balance. Utterly devastated, Geum cannot understand how this can be...his case has to be in valid. Slumping in his chair in disbelief, Geum knows he is done for. At the correction center, Jo Sung Doo waits for Geum Tae-Woong to arrive in the visitor's area. Geum proceeds to confess that he is Sung Doo’s father and can tell from Sung-Doo’s expression that he already knows this. Sung-Doo remains stone-faced as Geum continues to speak. Geum tells his son that there was a reason why he abandoned him and his mother, and that he was only hard on him in order to teach him how to survive. Then he gets down to business. He asks Sung-Doo to testify on his behalf at the upcoming trial, to use his available text messages as evidence to put the blame all the charges - for the misdeeds, murders and the whole lot - onto Kim. He promises, or rather bribes, Sung-Doo by saying that if he does this, he will be out of prison soon, then he will make it all up to him and be a real father to him. All of his assets, too, will be his to have. Jo Sung-Doo remains silent until Geum prompts him to answer. Slowly raising his head, Sung-Doo replies, ‘I understand. Okay.’ Geum Tae-Woong smiles, relieved that he still has the ability to manipulate someone to get him out. At the apartment, Do-Chan and Joon-Soo talk. Do-Chan says his job is done and leaves the trial to Joon-Soo and his team to handle. Joon-Soo replies that even to have one person rooting for one is something to be grateful for. He sincerely thanks Sa Do-Chan. Do-Chan replies that ‘I didn’t do this for your thanks, but thanks to you, I got to play prosecutor as much as I wanted. Let’s call it quits as we are both grateful’. As Joon-Soo gets up to leave, Do-Chan says he has something for him. In front of the Court House, Oh So-Ra reports on the trial against Geum Tae-Woong which is about to take place. In their office, Ha-Ra finishes putting on her gown while Baek Joon-Soo thoughtfully dons his gown. As they discuss how good it feels for Joon-Soo to wear his gown again, he speaks of a conman’s heart beating slowly whereas the heart of a prosecutor beats zealously. Ha-Ra agrees and speaks of justice prevailing. Joon-Soo queries does she want to prove to Sa Do-Chan that justice will prevail? She tells him yes, after all she has put him through. They agree on their strategy for the trial, quietly assured.